I've developed quite a love for shirt dresses, thanks to their ability to turn a casual mood into something more elegant. Though, much like marmite, shirt dresses seem to divide opinion between those who love them, and those who dislike them. Personally I feel as though they're flattering on all frames, but I may well be biased after years of buying them! I particularly love the tie-waist style of this dress, along with the elegant length that makes it ideal for most summertime occasions. This tropical delivery from Joe Browns was a complete day-brightener - literally! The colours of the dress are just as vibrant and beautiful as I was expecting, seeing in particular the coral and green shades pop. 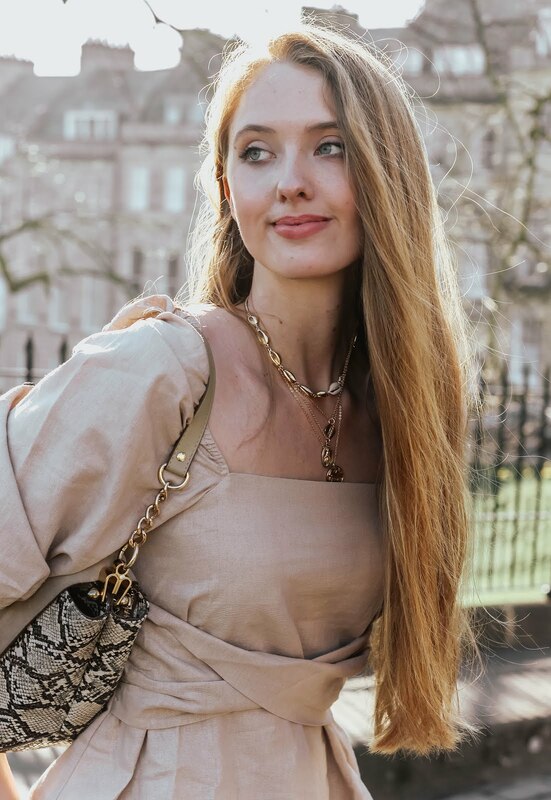 With printed parrots and flowers wrapping around the shirt dress, it's difficult not to imagine yourself wearing it in tropical climates, either with a pair of block-heeled sandals as I've done so here, or perhaps unbuttoned with a bikini underneath for afternoons spent beachside. Sadly, I'm not at the beach right now, however on the plus side, it means I can wear jewellery without worrying about it ending buried in a foot of sand! The inspiration of the 'lush fauna' in the Gulf of Papagayo is easy to see in this dress, and it goes a long way in inducing those summer vibes I've been chasing. In fact, they're so strong that even the thunderstorm taking place outside right now isn't enough to shake my tropical mood! Oh Gabrielle u look so beautiful in this floral dress, great colours and perfect setting! Beautiful dress, I love the floral print! I like shirt dresses and I agree that I think they're pretty flattering on most shapes. The tie waist version that you're wearing now is always a winner in my book! What a gorgeous print and silhouette! You look right at home amongst all the pretty flowers Gabrielle! I fall into the camp that thinks shirt dresses are so versatile and flattering! I love the whole outfit. It's super chic and perfect for the season, I really love it, especially the dress. By the way this is really random, but I LOVEEE your hair, it's honestly flawless! Amazing look! Love the entire outfit! Stay fabulous! Have a wonderful Wednesday! The perfect setting for a gorgeous dress! I love the tropical print, it really is stunning. You look amazing as always Gabrielle! Looking absolutely beautiful, Gabrielle, and how lovely is the garden you're in? Shirt dresses like this have a spot in my heart for its versatility, like you mentioned; being able to wear it as it is is wonderful but wearing it as something else, like an outerwear, is another thing altogether and I love it! I love the tropical print and you look beautiful! Another gorgeous post! This is so Summery! I want your pineapple necklace, its so beautiful! haha trust me to pick up on the smallest detail! Your dress is beautiful though, but that bag, oh my goodness, so so beautiful! I like shirt dresses a lot, and the print on that one is extra gorgeous. You fit right in to this wonderful garden. Wow what breathtaking pictures, I love your outfit, you look very pretty, thank you for sharing!!! Love this floral outfit and the photos are amazing!!! The flowers are booming rather quickly this season. Beautiful. You do look beautiful also. That dress is so summery and cute! Beautiful look and pictures! You are such a class act, Gabrielle! I greatly admire how you always carry yourself with such poise and look so elegant and chic in whatever you wear, be it a lovely shirt dress like this or fab workout attire, you are really such a gem! I love the pattern of the dress, which is indeed perfect to wear surrounded by such gorgeous flowers! I, too, love to be in and around nature, it's so tranquil and puts my mind at ease and I love breathing in and embracing the fresh air! I also agree that this dress would look great on everyone, it truly is a versatile and flattering dress! Thanks so much for sharing and I hope you're having a wonderful week so far, gorgeous girlie! You look absolutely gorgeous Gabrielle, the shirt dress fits you to perfection and I love the bold nature of the print, it matches perfectly with the flowered backdrop & your rings are gorgeous! <3!!! That dress is gorgeous! Love the jewelry and all the flowers in the background. Beautiful photos! Aw! Your dress matches the flowers - love it! I love everythings on this dress : the colour, the pattern, the shape and the length. This dress is so beautiful. You couldn't take the pictures in an other place. This is perfect. You're looking more gorgeous in that dress Gabrielle! so gorgeous! florals for garden walks is a very great idea! Look at these beautiful flowers! Girl, you look so gorgeous in that dress too! Very Spring and so refreshing! Shirt dresses are definitely great pieces to have in the wardrobe. I love the one you're wearing! It brings out the summer vibe. :D From dress to jewellery, everything looks perfect. You look beautiful as always Gabrielle! I had the pleasure to work with Joe Browns earlier this year and I love their colourful clothes! You're totally rocking this shirt dress, it very much reminds me of tropical summer vibes and holidays. Love how you've shot the pictures with the beautiful flowers. Have a wonderful weekend Gaby! Wow,, you look absolutely stunning Gabrielle. That dress is amazing. I adore the print and the location you chose for the shoot. Gorgeous photos ! I really love your dress. Such a lovely shirtdress on you! You look amazing! I love strolling around gardens, too, and your look is the perfect match for it! Oh Gabrielle, you look absolutely lovely in that dress. That's a very unique shirt dress and if you didn't mentioned that it was a shirt dress, I would have thought it's just a normal dress. Love the prints on it, gorgeous. How summery! I know that the flowers on the dress and the ones you took pictures of aren't the same, but it matches so well! Personally I was never into shirt dresses until I saw someone at my school completely repurpose a large, button down (with a weird pattern) into a really cute shirt dress, and since then I've been really liking that style! Oooo Gabrielle I love this post !!! I love shirt dresses too! Love the way this beautiful dress blends in with the flowers around you! Have a nice weekend. Stunning shots! You look absolutely beautiful!! Such a wonderful shoot! I love the details of this dress and the tropical vibe is my fave. Give me palms and I'm a happy girl. Your look amazing in this shirt dress! Anyway...you chose such a lovely and dreamy dress for this occasion! So perfect and rich of colors, simply amazing! Britain's garden are famous for a good reason, you've so many talented individuals who are passionate about gardening and a fair amount of those who have really turned gardening in an art form of its own. Strolling in a beautiful garden (especially during Spring) is one of the greatest joys life can offer, isn't it? Something about being outdoors is so healing. You look ravishing in that floral dress! Its print is absolutely beautiful and I do like the cut. Shirt dresses with a belt...is there anything more feminine? I remember illustrating one shirt dress recently...I do love them. Block heels are a great match for this dress. This outfit makes me thing of the Summer that is soon to come...that tropical print is really such a visual delight! The jewellery you have on.....why, it is absolutely beautiful. Every piece is so precious. The ring is very elegant and at the same time eye-catching...and that bracelet is so on the trend! Stunning photographs Gabrielle! I love the Spring time and it's so lovely to walk around with the sun kissing your face and to of course wear pretty dresses such as the one you're wearing above. Don't you just look lovely :) Your bag is also very pretty indeed. I shall email you soon by the way! Gorgeous pictures! !! Such a beautiful dress! You look gorgeous! Love your dress it's so tropical ! The dress is gorgeous and fits You so nicely! I really Love it! !